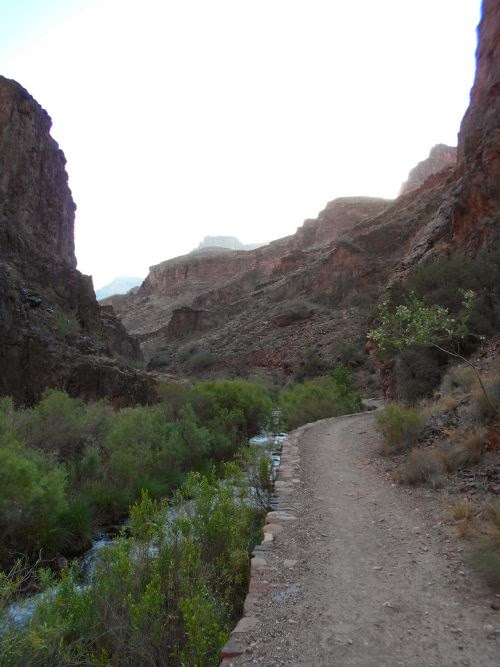 Another Long Walk: Day 48: Getting OUT of the Grand Canyon is the hard part! 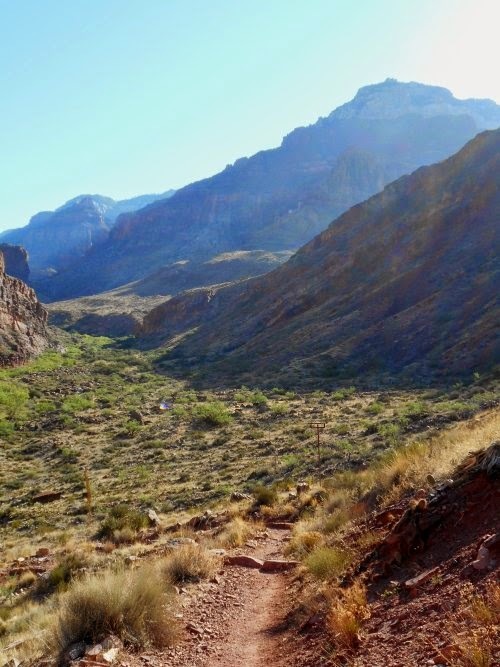 Day 48: Getting OUT of the Grand Canyon is the hard part! He didn't seem at all shy of people! May 30: I woke up early in the morning--the earlier I started, the earlier I could hike out of this death trap known as the Grand Canyon. Oh, don't get me wrong--it's gorgeous down here! But it's a death trap because, once again, temperatures were expected to hit somewhere near 100 degrees. At sunrise, it was probably close to 70 degrees already, and I knew it was only going to get hotter. A lot hotter. And I wanted to get myself up on that North Rim and 6,000 vertical feet up where the highs might not even break 80 degrees. And the sooner, the better! Despite my early departure, however, it seemed like half the campground was already empty. Many people left when it was still very dark out--I saw them walk off with their headlamps cutting through the darkness. They wanted to avoid the heat so much, they decided to start hiking even earlier than I did. I was a little envious, but I still needed to take photos for Walking 4 Fun, so I at least lingered until after "official" sunrise. I put "official" in quotes because being at the bottom on the canyon, the sun had to rise a lot more than normal before sunlight would actually reach so far down. The official sunrise, if you looked it up online, was near 5:30. The sky was brightening by then, but sunlight wouldn't reach the canyon bottom for hours to come. 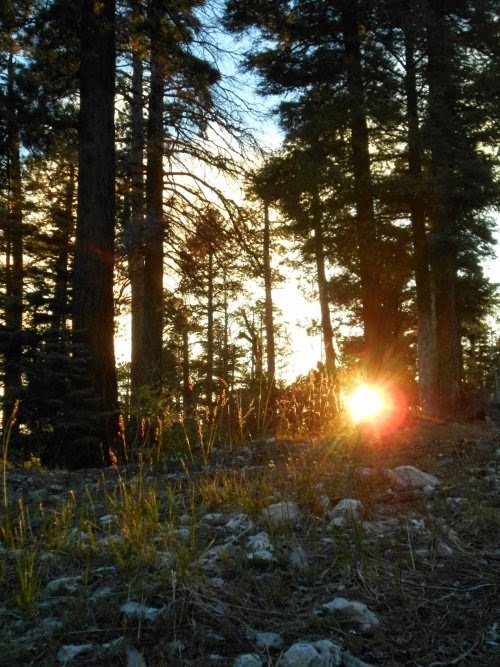 I made it almost to Cottonwood Camp, almost 7 miles away, before the first sunlight struck me. 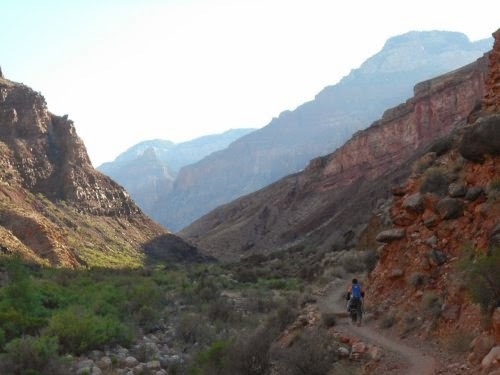 The South Kaibab Trail largely went down along the top of a ridge and therefore was in the sun most of the time, but the North Kaibab Trail went up a canyon--a completely different experience. I considered this a good thing too, even if the views weren't as incredible since it kept temperatures down. 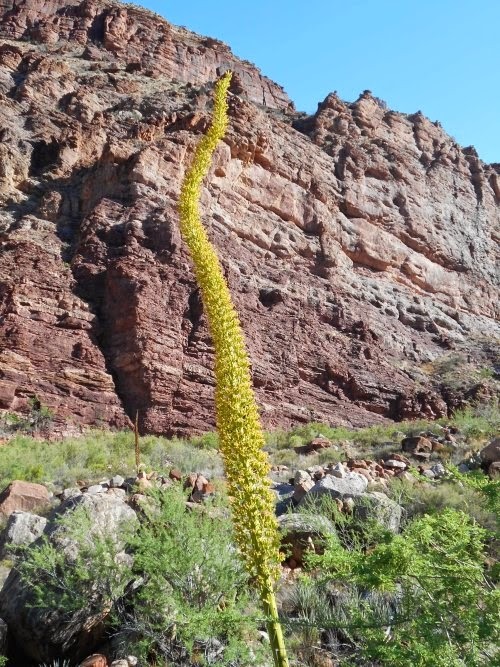 get high enough to reach the canyon bottom for hours! Which was good to help avoid the heat! So I filled up with water at Cottonwood Camp, then pushed onward and ever upwards. The views were nice, but nothing as amazing as they were the day before. From the canyon bottom, there were no wide, expansive views. 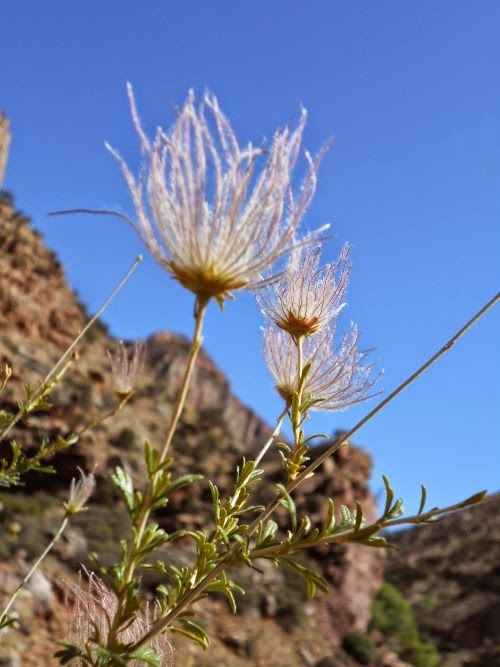 I couldn't see beyond the walls of the canyon I was in--the day before, on the top of the ridgelines, I could see for what seemed like forever in every direction! 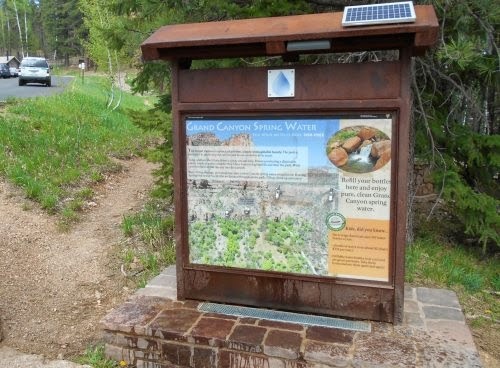 At the next water stop, which my data book labels as "pumphouse yard," there was a makeshift sign up saying that there had been a water main break and to get water there because there was no water available at Phantom Ranch or Cottonwood Camp. 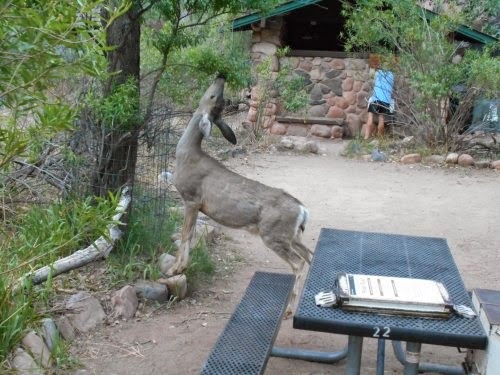 This surprised me greatly because I had just gotten water from both Phantom Ranch and Cottonwood Camp just that morning. 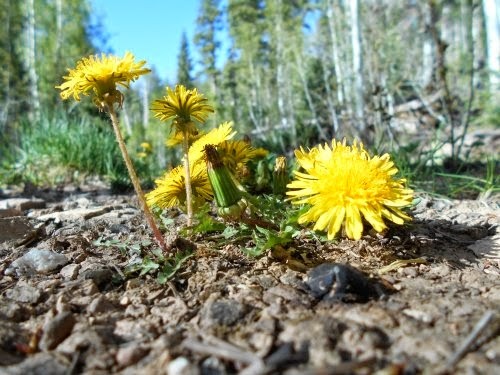 In fact, I had gotten water from Cottonwood Camp less than an hour earlier! The signage must have been either very old (and out of date) or very new (as in the break happened within the past hour, but I didn't see any breaks!). 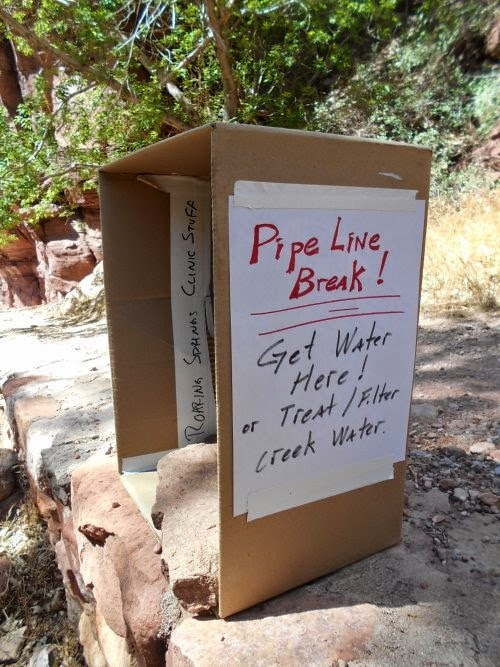 It also warned hikers that they could get water from Bright Angel Creek, but that they should treat the water if they did. I was a little amused with that because I kind of doubted most hikers had any way to treat water at all. Why would they when there was supposed to be perfectly safe water to drink all along the route?! Somewhat ironically, I did have a system to treat water since I'd been hiking for over 700 miles now and most of it didn't have safe water available for drinking, but Bright Angel Creek looked so good and seemed so unlikely to be contaminated (for reasons I'll explain soon), I wouldn't have thought twice about drinking the untreated water. I even told other hikers who were headed down that I sincerely doubted they'd get sick from drinking it untreated, although I did admit that I had no way to guarantee as much. But if it's the difference between drinking untreated water and not drinking any water at all, just drink the untreated water. They'd die a lot faster from no water than they would from contaminated water--if it was even contaminated in the first place! 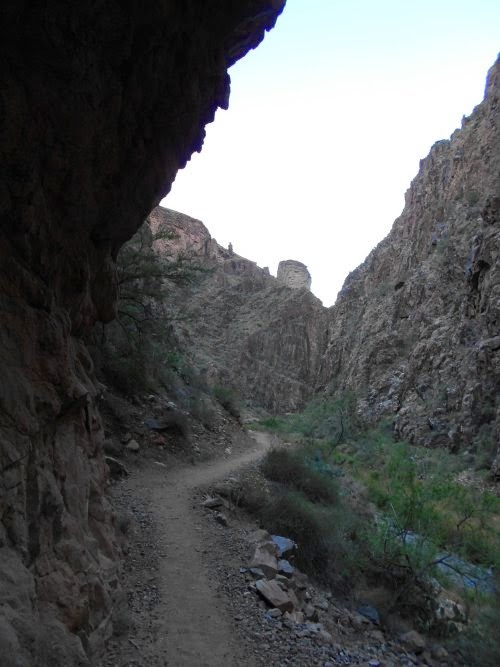 But the pipe line break, wherever it was, was somewhere further down the canyon and wouldn't affect me. I filled up with water from the pumphouse yard anyhow--the next water source was still a few more miles up trail, after all, but I should be able to get more from the next water source. One woman asked if I was one of those people doing a rim-to-rim-to-rim hike. 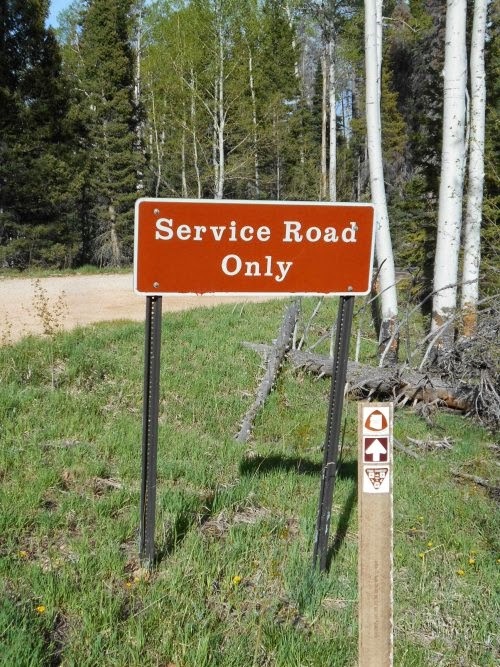 I'd never heard of such a thing, and they explained it to me as someone who walks from the South Rim, to the North Rim, then back to the South Rim. 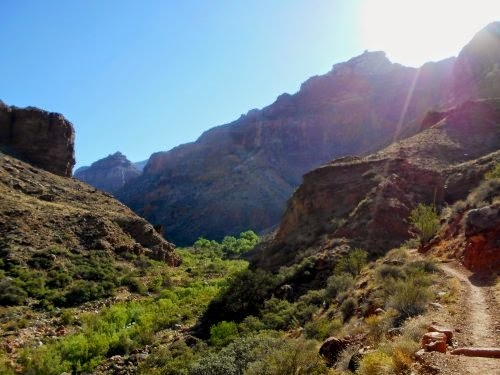 Which makes sense, I suppose--especially for someone who wants to hike across the canyon but doesn't have a shuttle back to their car that's now on the wrong side of the Grand Canyon! The woman had heard several people were doing that and seemed somewhat in awe of them, and I guess I looked like a "professional" hiker and she thought maybe I was one of "those" people. I laughed, though. 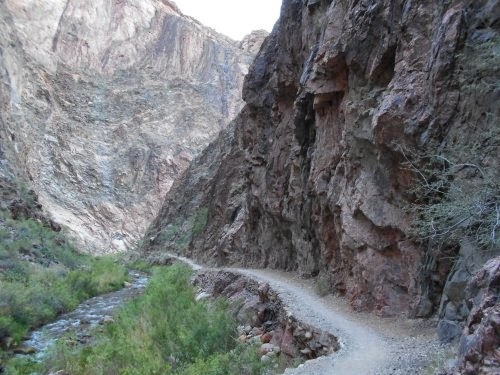 It was probably 50 miles to go from rim-to-rim-to-rim. 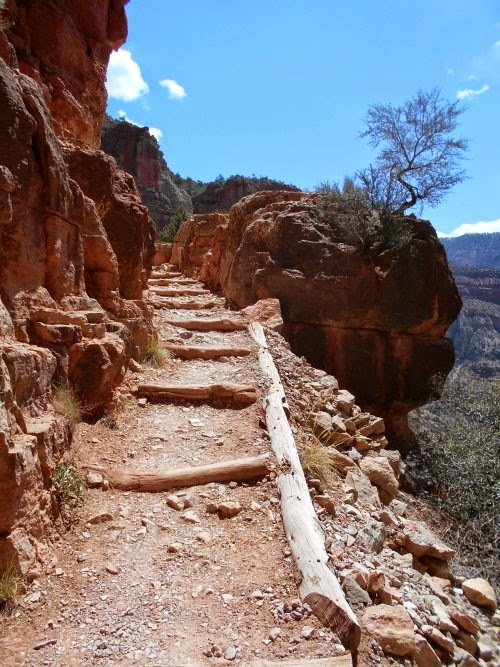 Even with the steep terrain of the Grand Canyon getting in the way, I didn't consider it very ambitious. "Wimps!" I declared. "They're wimps!" =) Then I explained that I had actually hiked in all of the way from the Mexican border which, according to the mileage in my data book, was now 716.0 miles away. The woman's eyes just about fell out and her jaw dropped open. It was actually quite funny. 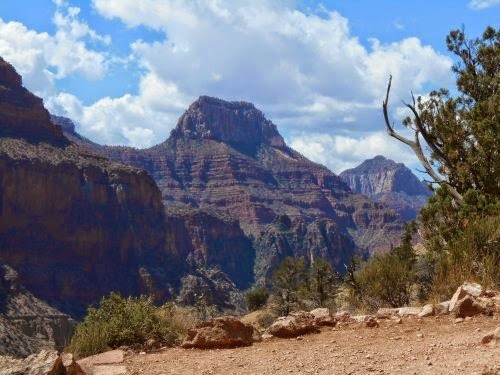 I also met a young girl--she looked like she might have barely been out of her teens--who was hiking down and across the Grand Canyon to the South Rim with her mom. Her mom hadn't arrived yet and she was going to keep going, then she returned a few minutes later. "You're going the wrong way!" I told her. "The South Rim is the other way!" 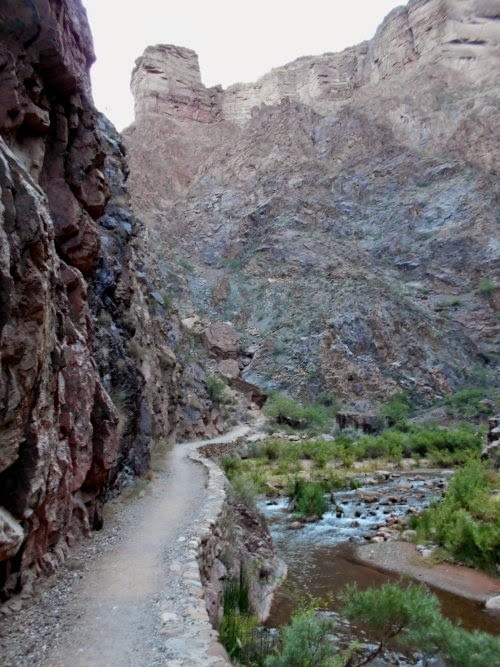 But she had seen the bridge across Bright Angel Creek just down the trail and turned back to wait for her mom. Apparently, her mom was scared of heights--or maybe it was a fear of bridges--and she wanted to make sure her mom got across it okay. This bridge, keep in mind, wasn't a very big one. It probably wasn't more than 30 or 40 feet long and crossed a span that couldn't have been more than 15 feet deep. It was also a very solid bridge--not one of those suspension bridges that gallop up and down. "Wow," I told her, "if your mom has trouble with that bridge, she's really going to have a problem when it comes time to cross the Colorado River. This bridge is nothing!" "Yes," she told me, "we're a little worried that." "Maybe you can lead her across the bridge with her eyes closed," I suggested. Then she told me that her mom brought a lot of cash in the hopes of hiring a mule to carry her across. That struck me as hilarious. I'd think that would be even scarier! 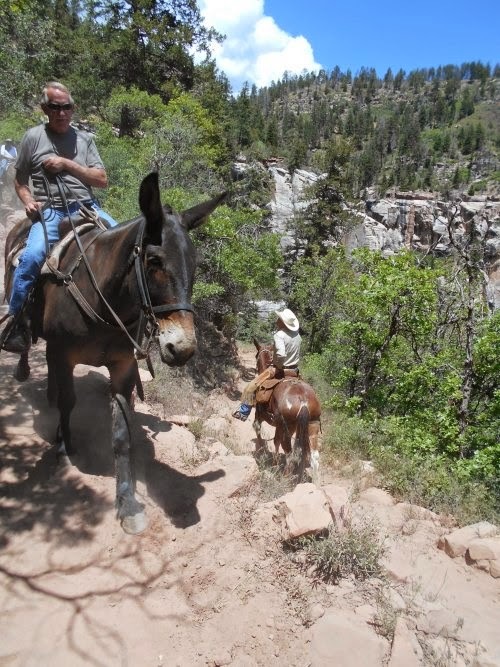 What if the mule freaked out and bucked her off? Or decided to commit suicide and jump? Or... yeah, okay, none of that would probably happen, but there's a certain amount of control you have to give up when you trust your life to an animal. It seems logical that if someone were afraid of crossing a bridge, you'd want more control of the situation, not less. Then she joked, "We might have to blindfold her and then put her on the mule to go across the bridge." And I replied, "I would pay money to see that!" It got me thinking about all of the antics that this trail has seen over the years, though. 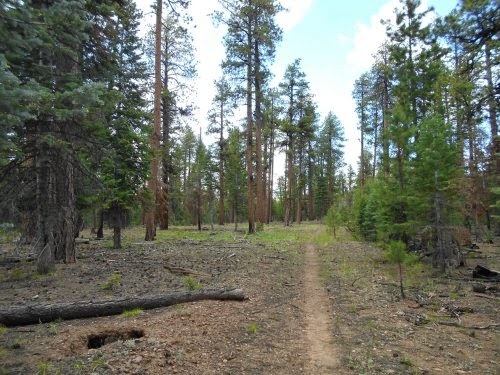 If trails could tell stories, this trail would undoubtedly have a heck of a lot of them to tell! 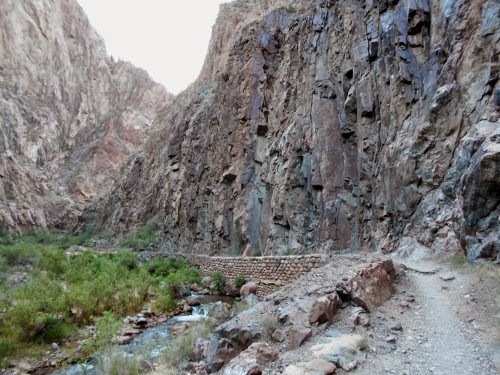 Stories from death to hilarity--this trail has probably seen it all. Speaking of hilarity, another story as told by another hiker I met on the trail.... He said he once camped down near the bottom years ago when a man came through carrying a bicycle on his back. Bikes aren't allowed on this trail--probably a good thing with all of the people and mules that use the trail--but there was a bike race that led directly through the Grand Canyon, so all of the participants had to walk or carry their bikes through. This guy had rigged something up so he could wear his mountain bike on his back like a backpack, hiked all the way down one side then all the way back up the other before he could take it off and ride the rest of the race. 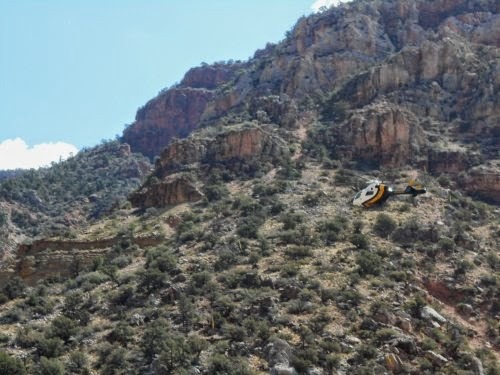 Shortly after leaving the pumphouse yard, a helicopter flew by in the canyon--which was really cool to see. Now that's traveling in style! A few minutes later, I approached some other hikers heading downhill. "Turn around while you still can!" I said ominously. "Unless, of course, you can hitch a ride with a helicopter on the way back up. I just tried doing that, though, and it didn't work. I probably needed to show more leg." They laughed, which was my intention, but we were all curious about the helicopter. It didn't seem normal for it to be flying so low in the Grand Canyon. Was there a medical emergency somewhere? Did it have something to do with this supposed pipe break I'd been hearing about? Still no sunlight on the canyon bottom! 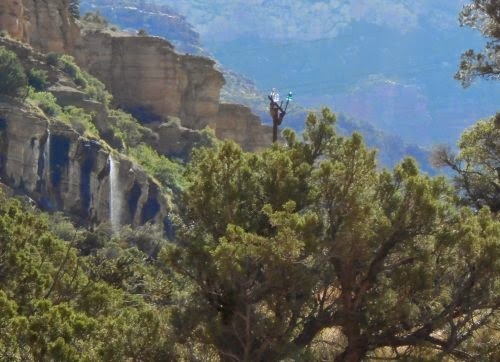 It wasn't long before I discovered that the helicopter landed at a building by Roaring Springs, and I saw it take off from below me and zoom back from whence it came. The trail had climbed well above the building at this point so the helicopter was actually flying maybe one or two hundred feet below me. It was a little weird to be seeing a helicopter hovering the air below me. There was another hiker nearby and I quickly stuck out my thumb as a joke. "Come on, man!" I shouted at the helicopter. "I've been waiting for a ride for, like, forever man!" 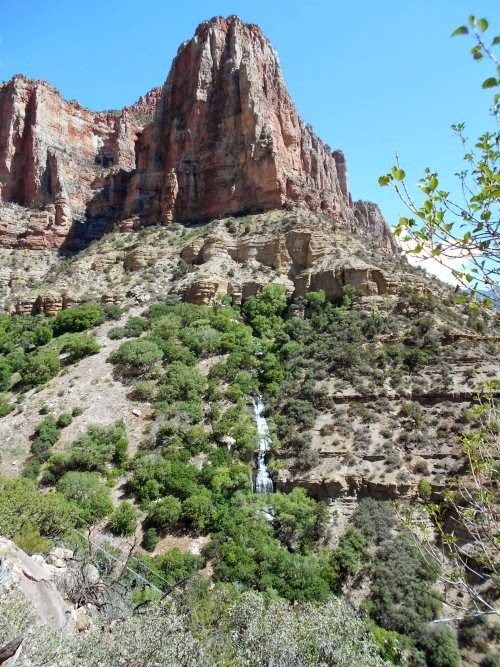 I said I'd mention why I wasn't too worried about the quality of the water in Bright Angel Creek--it's because most of the water in it came from Roaring Springs, which is an enormous spring that spills out of the side of an even more enormous cliff. It's dramatic--a flood of water pouring out of the side of cliff into a waterfall. Not over the top of the cliff, mind you, but out of the side of it. It was probably coming out from the cliff a thousand feet below the rim, and another thousand feet up from the bottom. There wasn't any real development between it and where the trail followed the creek. No agriculture, no industry, no cities or towns. If the water was polluted, it probably came from hikers soaking their feet in the water. But as nasty as those feet might be, it's probably not enough to kill anyone! So that's why I felt fairly confident about drinking water from the creek even if it wasn't treated. There just wasn't anywhere for the water to really get contaminated. I said before--a lot of hikers weren't from the United States and didn't speak English as their native language. And sometimes, it wasn't obvious that they were foreigners when I approached them on the trail, so I'd go on about, "It's not worth it! Go back! Go back while you still can!" and they'd think I was being serious. As soon as they said something and I heard the thick accent, though, I'd let them off the hook. "I'm just kidding--it's totally worth it. Carry on!" But the hike up is exhausting. Even in as good of shape as I was in after hiking over 700 miles to get here, the long uphill climb was wearing me out. And even more surprising, three days after I climbed that 80-foot fire tower, my thighs were still sore from it! I could really feel the soreness heading uphill now. How the heck did a measly 80-foot tower make my legs sore for the next three days now?! Temperatures, on the other hand, seemed to have stabilized. 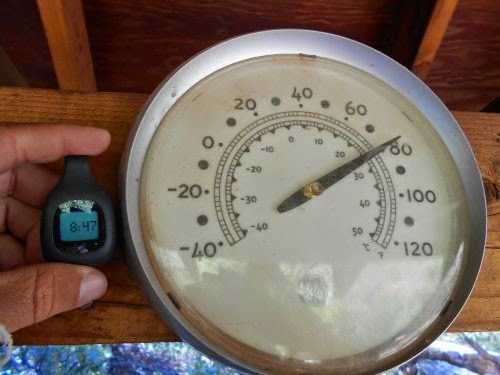 I knew it was only from my perspective--temperatures undoubtedly were still rising, but since temperatures cool as elevation rises, the two kind of canceled each other out, and most of the day I spent in 80 to 85 degree weather. Still uncomfortable warm, but it would have been a lot worse had I stayed at the bottom or started later in the day. Another group of people I met was a family with two young kids. They didn't look like they could have been more than 10 years old at most. The younger one looked like she could have been 6 or 7, and I first spotted them by a footbridge over 2,000 feet down from the top of the rim. It made my heart proud! I didn't know them, but a lot of adults struggle just to get that far down the trail, and these two kids had done it. They didn't even seem to be complaining about it, although they did seem a bit tired. Who can blame them? They were the only kids I saw the entire time I was in the inner gorge of the Grand Canyon, though, and I was glad to see that at least some parents would take their kids on such a rugged hike. 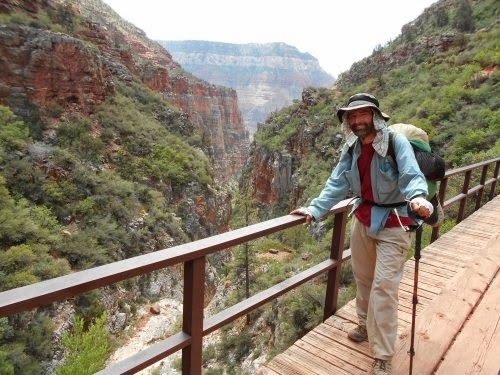 Near the end of the long climb to the North Rim, a group of three people from Connecticut and myself started passing each other at regular intervals and I started complaining, mostly in jest, "Where's the top of this stupid trail?!" Then I'd see them again, "Does this thing even have an end?!" And just a general, "Stupid, no good piece of crap trail...."
They beat me to to the top of the North Rim and as I ascended those last few steps out of the canyon, the three of them started applauding my arrival. I couldn't help but laugh--I knew they were doing it because of my mock complaints about being exhausted and my continual asking about where the top of the trail was, but the applause was funny. I stopped at the rim to get water--there was a water station at the top and the last place I'd likely be able to get water for the rest of the day. It was time to fill up! My permit allowed me to camp pretty much anywhere on the trail once I got two or three miles away from the rim--in section NB9--so I still had to hike for another hour or so to camp legally. As late in the day as it was, I probably wouldn't make it out of the park. The park boundary was another 13 miles away. I figured I was good for another 5 to 10 miles, though. I'll hike for a couple of hours then see about finding a good place to set up camp. Once I left the trailhead and continued hiking north on the Arizona Trail, not only did Arizona Trail signs start marking the route once again, but absolutely nobody was on the trail anymore. 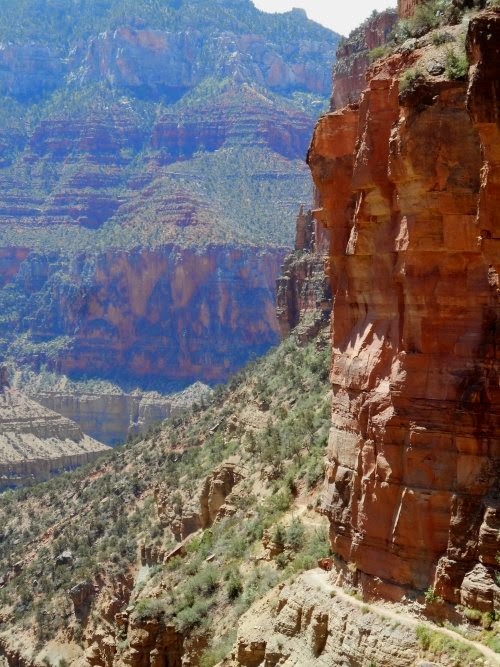 Everyone wants to see views of the Grand Canyon and hike into the Grand Canyon, but apparently nobody was interested in walking away from the rim and into the forests. 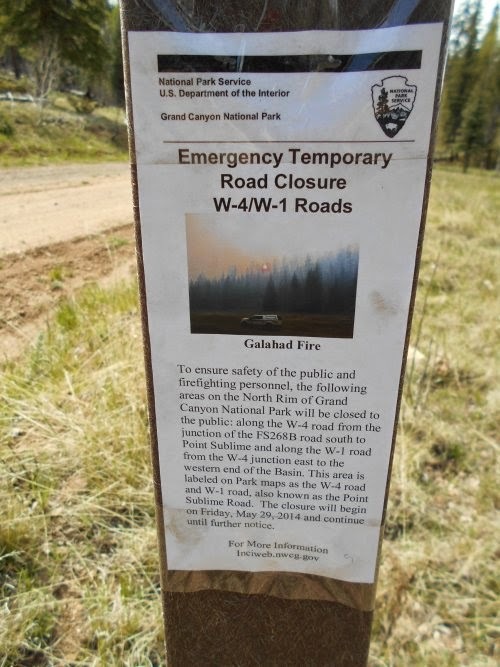 A couple of miles further up the trail, I ran into my first worrisome sign: A warning had been posted to an Arizona Trail marker that the road ahead was closed due to the Galahad Fire. That must have been the huge column of smoke I'd seen from the Grandview fire tower lookout, but I was told it wasn't affecting the Arizona Trail. 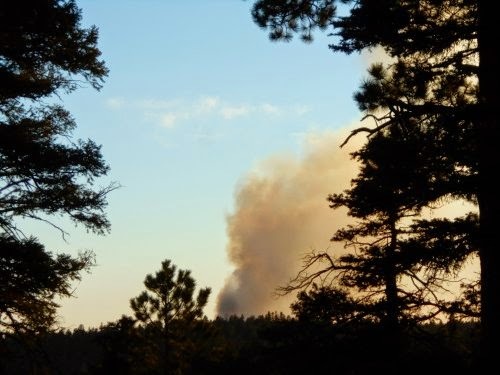 Not just by the guy in the fire tower lookout, but also the ranger who issued my permit to camp in the Grand Canyon when I explicitly asked him about the fire. The sign didn't say anything about the Arizona Trail itself being closed, but I wasn't entirely sure where the closed roads were located or if, perhaps, they overlapped with the Arizona Trail. 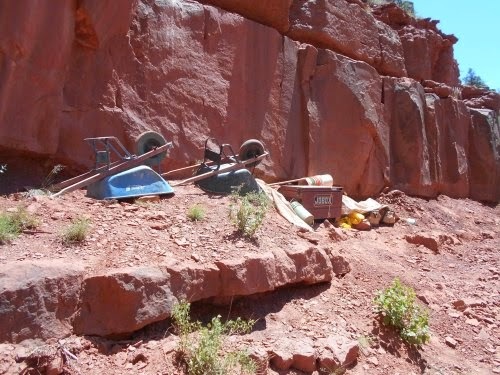 But they did put the warning on an actual Arizona Trail marker! I soon passed a group of people that appeared to be clearing detritus along a road, as if they might have been creating a fire break. But they didn't have firefighting outfits on and I figured that was a good sign... until I went another mile or two when I saw an actual fire truck pulled off on the side of the road with men in firefighting uniforms doing similar work. Hmm... It seemed like I was getting closer to the fire.... I couldn't smell any smoke in the air, but the smoke could be blowing away from me rather than towards me for all I knew. 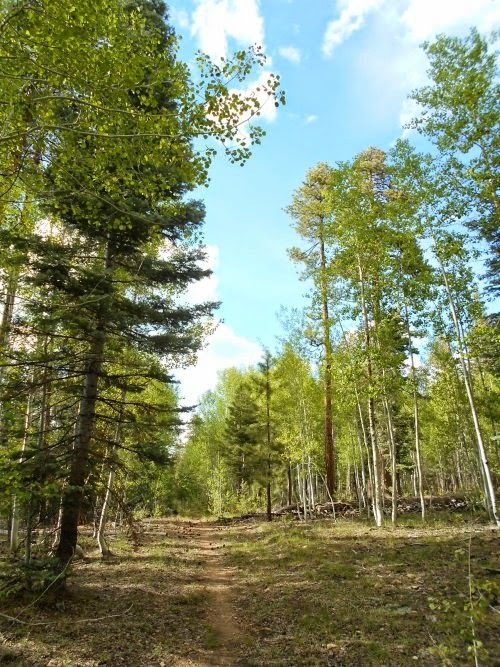 Once I reached the North Rim, the trees were thick! 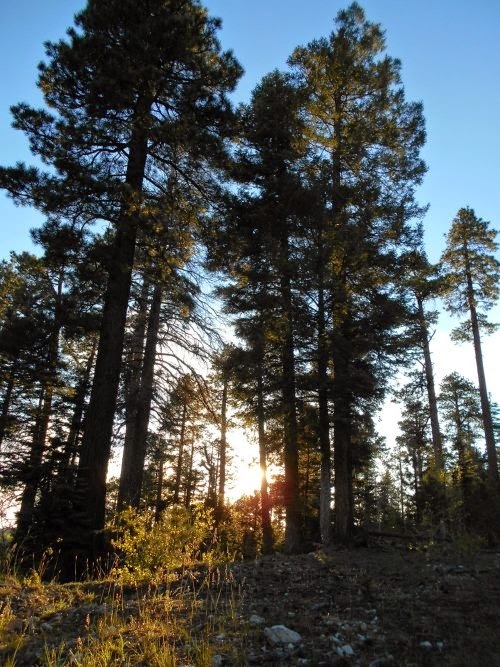 It was perhaps the thickest forest I'd seen in all of Arizona. 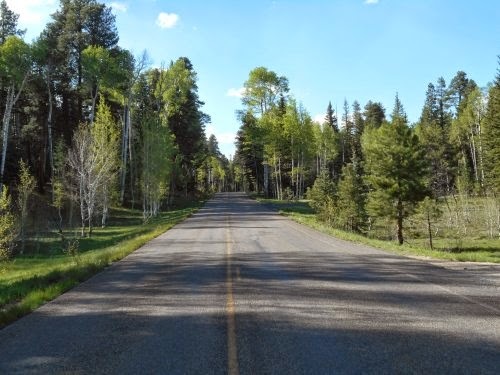 The last few hundred miles were largely forests, but mostly thin ones with trees spaced far apart. On the North Rim, it looked like I had been dropped in the Pacific Northwest. The trees were thick, with a thick canopy that let very little sunlight hit the ground. And it provided absolutely no views. Even at the trailhead on the North Rim, I couldn't see the Grand Canyon through all of the trees--and I was standing on the actual rim! Consequently, I couldn't see any plumes of smoke to get a sense of where the fire was or how close it might be--except for these firefighters I was seeing on the trail, and the warning about roads being closed. I wanted to ask the firefighters if the Arizona Trail was still open and how close the fire was, but I was afraid if I asked, they'd tell me it was closed and tell me to turn around. So I kept hiking and didn't stop to ask them anything. Another hour later, I stopped near the top of a small hill for the night and managed to get a sliver of view between the trees where I could see a large plume of smoke rising into the sky. It was well to the west of my location and far off the trail. Yeah, I was totally safe from that fire. No worries there, but I still wondered if the road I followed next to was actually closed or not. Maybe they closed it to vehicles so they wouldn't interfere with the emergency vehicles but foot traffic was still allowed? I still don't know! But it wasn't my problem anymore.... I was now hiking away from the fire. I set up camp shortly before dusk after covering 21.0 miles. Not a bad day after having climbed from 2,463 feet above sea level to about 8,800 feet above sea level--a 6,337 foot increase in elevation. And it was a heck of a lot colder this evening than the night before! Tonight I'd be wearing fleece! At 8:47 in the morning, it was already 80 degrees outside. IN THE SHADE! to beat the heat--it was just going to get worse! 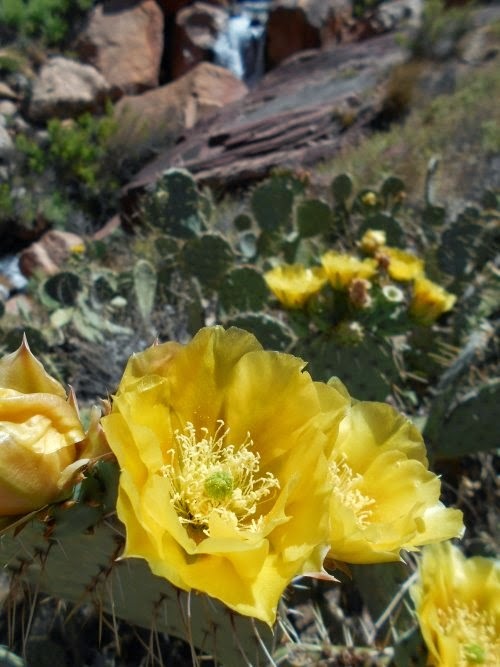 less those that are blooming! at every source that had water faucets available! to see so much water pouring directly out of a cliff! 14 miles. And 5,768 feet straight up to the rim! actually working on the trail when I passed by. 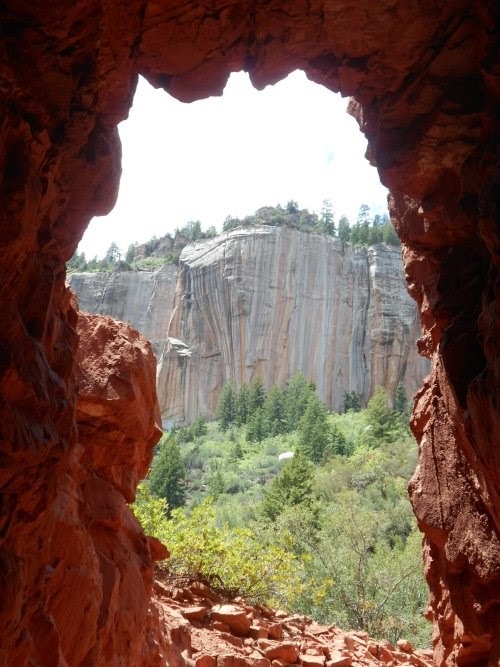 The trail runs through Supai Tunnel, which opens into this view. Horses on the trail! Make way for horses! in my photo, but if you look closely, you can see them. and burns on this trail--is there anywhere in Arizona that doesn't burn?! to the sign in front o fit! away from it, though, so we should be safe from it! Sunset in the Grand Canyon. Day 6: A Beautiful Day for Cussing! Day 51: The End of the Arizona Trail! Day 50: The End is Near! Day 47: The Grand Canyon!